If you are a fashion enthusiast, there’s an event you can’t miss: The Vallarta Fashion Awards 2018, a fashion gala for a good cause, where the proceeds will benefit the local non-profit association Incluyéndonos AC. 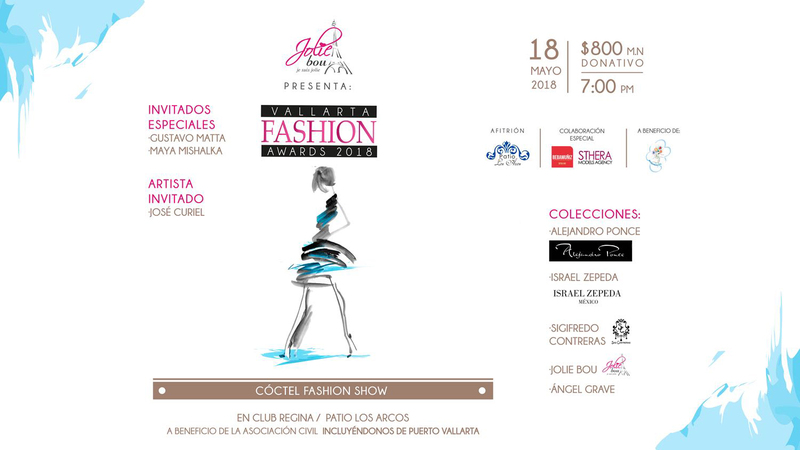 The fashion awards will be held next May 18 at the Los Arcos Patio in Club Regina of Puerto Vallarta. Special partners such as Beba Muñiz and Sthera Models Agency will collaborate with this altruist fashion event and will be joined by special guests like the designer Gustavo Matta, the actress Maya Mishalska, the artist José Curiel, as well as Pedro Montiel, TV host of the show Cocktail de la Moda. During the event, four famous Mexican fashion designers such as Alejandro Ponce, Israel Zepeda, Sigifredo Contreras and Ángel Grave will present their collections. A silent auction will be held as well, for the benefit of the aforementioned non-profit association Incluyéndonos A.C..
Tickets are $800 pesos and are available at Nacer Yoga Studio in Plaza Península and boutique Jolie Bou at Plaza Caracol. You can also get tickets and further information via telephone at (322) 294-7423, (322) 221-2716 and (322) 232-1142.